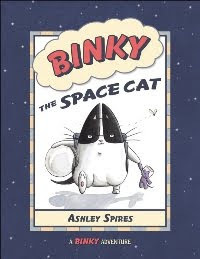 I’m not sure if the book will actually turn out to be funny, but I am thirteen pages into Binky the Space Cat by Ashley Spires and I am amused. We meet Binky (the cat…pay attention) as he gets his Space Cat Certification in the mail. Now, I’ve been staring at the cover of this book for a couple of months and I assumed that it would be a space adventure comic/kids book – a reasonable assumption considering it has the words space and cat together in the title. While that could have been fun, the concept for this book is better than that. See, Binky is an indoor cat – his house is his space station and the outdoors is “outer space” (naturally). Hang on – I have to finish the book….There. Done. Okay, I’ve finished the book, and it stayed funny all the way through. Not only is Binky on his way to becoming a space explorer, he is already something of a superhero in his own house. See, he is vigilant in protecting his humans from aliens! Aliens = bugs, but he is not sure why his humans haven’t figure this out yet. If you have an aversion to comics (although, if you did you probably would have stopped reading by now) just forget I mentioned that it was a comic. It looks a lot like a traditional kid’s book, with text instead of word balloons (for the most part), but the pictures are presented in a way that moves the story on – the sequential art tells the story along with the words in a way that straight storybooks rarely do. It makes the book hard to read to a large group of kids, but it makes it delightful to read to a kid or two snuggled around you on the couch. Ashley Spires does a fine job with her first comic/graphic novel/storybook. The art is quirky and fun (hard-hitting journalism there) her writing is funny and clever, and she skillfully includes cat-tooting, cat poop, and a coughed up hairball in ways that will be hilarious to the book’s intended audience (6 years old or so, with some assistance, to 9 or 10 years old) and inoffensive to the suppliers of the book (YOU). Nicely done, Ashley. If you get and like this book, I would recommend another Kids Can Press book, Skaredy Squirrel. It is in between a traditional kids book and Binky in the way the story is presented – less comic, more storybook, but I think they would go well together. BTW, Kids Can Press has just become my favourite publisher for the fact that they include the Fountas & Pinnell reading levels. This can make planning guided reading lessons a lot easier. The teacher part of me thanks you.